The heartwood of jarrah ranges from light red or brown to a darker brick red, though it does tend to darken with exposure to light. The sapwood ranges from pale yellow to pink. The grain is interlocked or wavy, and sometimes even curly, with a texture ranging from medium to coarse. 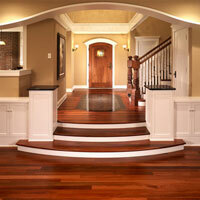 Jarrah is a very hard and durable wood, is highly resistant to insect attack, and is reported to be odorless. 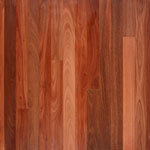 As a flooring option, jarrah’s hardness is roughly equivalent to that of amendoim. It is one hundred forty-eight percent harder than red oak and eighty-seven percent as hard as santos mahogany’s ranking of 2200. Because of its hardness, high density, and interlocked grain, jarrah tends to be difficult to machine. This species has a moderate blunting effect on cutting tools, but it glues and finishes well. Jarrah’s uses include heavy construction, veneer, cabinetry, furniture, and objects turned on a lathe.